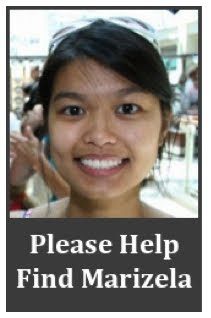 The cousin of my favorite Fox Contributor Michelle Malkin went missing on March 5, 2011. Her name is Marizela Perez, an 18 year old Filipino who disappear after walking out from a grocery store in Seattle's University District. If you ever have any information about her, please call: (206) 684-5582. For more information: Visit findmarizela.com or michellemalkin.com/2011/03/17/www-findmarizela-com. Visit her FACEBOOK HERE.